There are so many recipes out there for Thanksgiving that you’ve probably already got yours lined up, but I’m late to the game this year so I thought I’d share my favorites with other latecomers who may still be looking for ideas. I admit I’m a bit of a traditionalist when it comes to Thanksgiving. I love most of the dishes that go with this holiday and I don’t like to muck them up too much. I also think people have some strong opinions about their Thanksgiving fare: giblets & livers in the stuffing or not; marshmallows on your sweet potatoes or not and these days, do you deep fry your turkey or brine it? We all have memories of what our childhood holidays were like and as adults we either try to remake them or escape from them, depending on your experience. I’m escaping from the liver bits in the stuffing and the marshmallows, but I do use my mother’s stuffing recipe with a few updates. My turkey recipe comes from Martha Stewart and I’ve made it for a few years now, because it makes a delicious, tender turkey. Some side dishes you might like to go with it are sweet potatoes with bacon , fig salad with chevre or roasted beet salad, butternut squash soup and romanesco. Whatever you decide to do, I hope all your food is delicious and you have time to relax! The turkey needs to soak for about 24 hours, so plan accordingly! -Bring 1 quart of the water, the salt, bay leaves and spices to a simmer, stirring until salt has dissolved. Let cool for 5 minutes. -Line a 5-gallon container with a large brining bag (I’ve used an unused garbage bag for this). Place turkey in bag and pour in salt/spice mixture. Then add the rest of the water (24 cups) and the other ingredients. Tie the bag, if turkey is not submerged, weight it with a plate. Now, the recipe says to refrigerate it for 24 hours…I’m sure that’s the best way, but I personally don’t have that much refrigerator space, so I put it in a cool place in my basement and this has worked just fine. I’ll leave that decision to your own personal judgement, but do turn the turkey once during the 24 hour brining period. Now, read on for the cooking part of the deal. 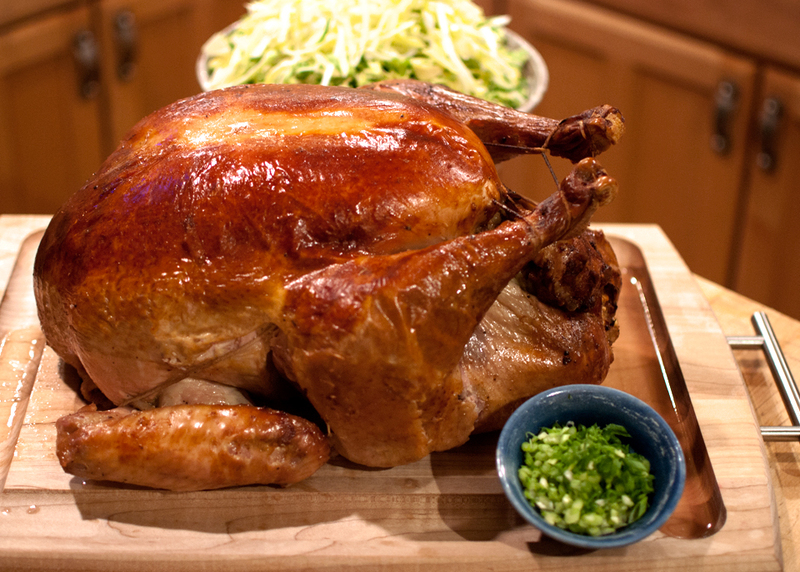 First, be sure you give yourself time to take the turkey out at least 2 hours before cooking! -Remove turkey from brine and pat dry, inside and out, with paper towels. Place carrots, parsnips, celery, onion and white turnips in bottom of a roasting pan (these veggies are to add flavor to the turkey drippings and make a delicious gravy). Place turkey, breast side up on a rack set in a roasting pan. Fold wing tips under turkey and let stand at room temperature for 2 hours. -I’ve found that during roasting, there hasn’t been enough liquid to properly cook the veggies, so I’ve been adding 1-2 cups of water or stock to the pan before roasting. Place rack on lowest level in oven. Heat oven to 450 degrees. Combine melted butter and white wine in a bowl. Fold a large piece of cheesecloth into quarters and cut into a 17 inch, 4 layer square. Immerse cheesecloth in the butter and wine and let soak. -Sprinkle 1/2 tsp salt and pepper inside of turkey. Fill large cavity loosely with stuffing. Do not pack tightly. Tie legs together loosely with kitchen string ( a bow will be easy to untie later). Fold neck flap under and secure with toothpicks or skewers. Rub turkey with the softened butter and sprinkly with remaining 1 1/2 tsp salt and pepper. -Lift cheesecloth out of liquid and squeeze it slightly, leaving it very damp. Spread it evenly over the breast and about halfway down the sides of the turkey, it can cover some of the leg area. Place turkey, legs first, in the oven. Cook for 30 minutes. Using a pastry brush, baste cheesecloth and exposed parts of turkey with butter and wine mixture. Reduce oven temp to 350 degrees and continue cooking for 2-2 1/2 hours more, basting every 30 minutes or so. I used this recipe on a 12 lb turkey and it was done after 3 hours, but a larger turkey will take longer. -After 2-3 hours, depending on the size of the turkey, carefully remove the cheesecloth and discard. Continue to baste the turkey, using the pan juices if there are enough and begin checking the temperature for doneness when it starts to look golden brown. Check the thickest part of the thigh, which you want to be 170-180 degrees. The stuffing should be between 140 and 160 degrees. Keep checking every 20-30 minutes and basting after you check. -When turkey is done, transfer to a platter or cutting board and let rest for 30 minutes before carving, this allows the juices to return to the meat and gives you a juicier turkey. -Cook bacon or prosciutto until lightly browned. Remove with slotted spoon to paper towel lined plate and set aside. -Saute onions and leeks in the bacon/prosciutto fat and a little more butter or olive oil till translucent and slightly browned. -In a separate pan, saute mushrooms in 2 tblsp of butter-heat butter until it foams, then add mushrooms and cook until nicely browned. -In a large bowl, combine bacon/prosciutto, onions, leeks, mushrooms, apples, thyme, sage and chestnuts. Add breadcubes and mix until combined. Then add stock. Be sure everthing is nice and moist and add more stock if needed to achieve this. Then add the Parmesan and stir until all is combined. -Salt the inside of the turkey with a generous amount of salt. Then stuff turkey loosely, putting leftover stuffing in another baking dish if needed. Close turkey flap with toothpicks or skewers and roast. 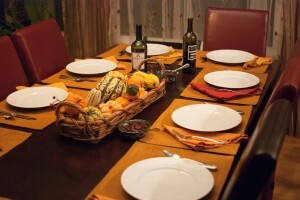 This entry was posted in main dish, menus and tagged holiday food, stuffing, Thanksgiving, turkey. I tried this and it was fabulous! Thanks for passing on the recipies!!! 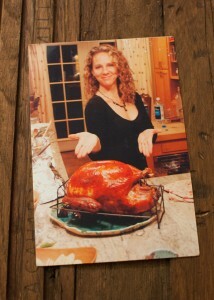 Best turkey I have ever made and Mom says it beats any she has ever made also – now that’s saying something! Moist turkey and the gravy was yummy!!! Will do again for sure!